In ancient times, Vulcan was the Roman god of fire. He served the other gods by forging their arms and armor and creating beautiful artwork and jewelry. 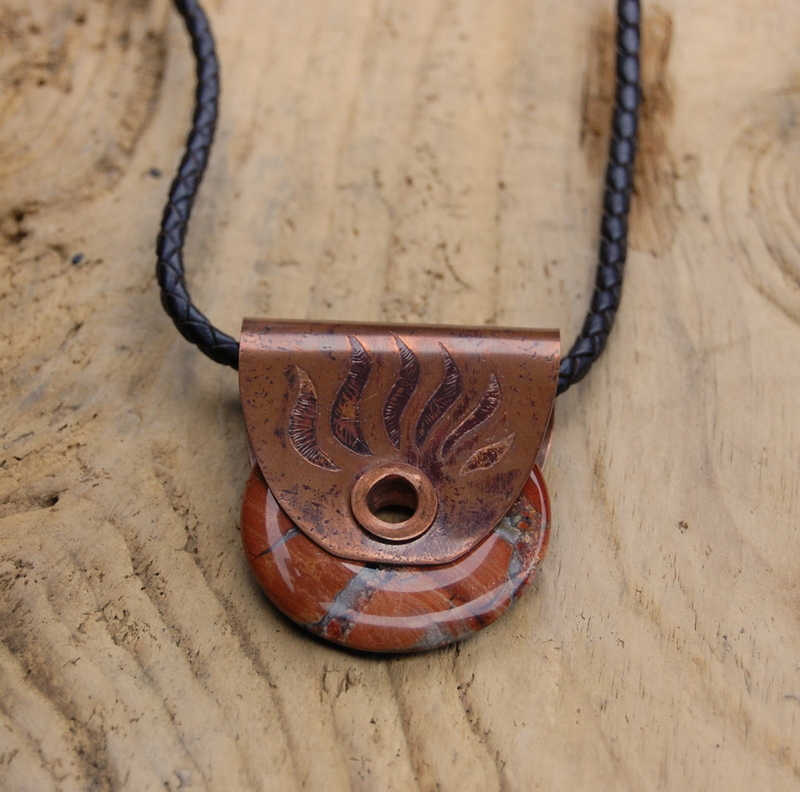 In this original pendant, the pairing of the flames of Vulcan’s forge with the fiery brecciated jasper donut creates a powerful amulet for fostering your creativity, while also nurturing your inner strength, health and well-being. Your Vulcan’s Forge amulet will arrive strung on a dark brown 18 inch braided leather cord with sterling silver lobster clasp. You can choose to wear the pendant showcasing either side …wear it so that the jasper stone peeks through the hand-pierced flames on one side, or flip it over to display the etched version of the flames on the other … it’s like having two pendants in one! The hand-forged copper bail is wide enough to accept virtually any chain that you may already have … making your pendant a versatile addition to your collection. A jewelry care guide is included with every purchase and returns are hassle-free. Click the add to cart button and claim this amulet as your own today!